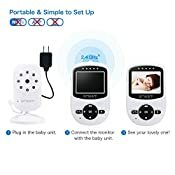 Enjoy the convenience this baby monitor provides- place a camera in whichever room you want to keep an eye on instead of needing to stay around checking on your baby or elders, you are free to rest or get chores done in busy schedule. ☑Upgraded transmission technology: 2.4GHz Wireless Transmission provides crystal clearer sound and image without any delay. ☑ Night Vision: Infrared night vision technology provides clear b/w pictures of your baby's movement even in dark. 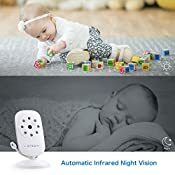 Allows you and your baby to sleep in peace. ☑ Sound Activated: The screen will auto on when baby sound is detected. ☑ Two-way Communication: Enables you to soothe and talk to your baby in lifelike sound without distance limitation. ☑ Simple Installation and Use: Simple to set up and easy to carry and use at everywhere you want. ☑ 4 Lullabies: Remotely control 4 sweet lullabies by the parent unit to lull your baby to sleep. 1. If you have warranty or technical support issues, please do not hesitate to contact us before you leave review and feedback; we will help you to solve the issue within 24 hours. 2. Press the Reset button on the back of the parent unit and the monitor unit if any problems of the device occurred. 3. Please charge the unit before use. 4. Recommended to set the volume to medium level to extend the service life. 5. Do not place the parent unit too close to the camera which may cause noise. 6. The camera needs to be adjusted manually. It cannot be remotely controlled. 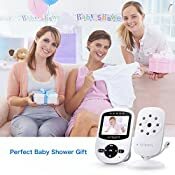 ✿REAL-TIME VIDEO & EASY CONNECTION✿ The baby monitor with camera can allow you to monitor the baby's activities in real time without any delay. It can be connected by holding the Pair button for a few seconds. 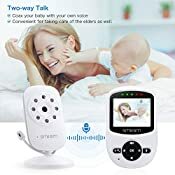 ✿TWO-WAY TALK & NIGHT VISION✿ The two-way talking baby monitor with camera and audio can soothe and talk to your baby with the sound of your own voice. Infrared night vision technology provides clear b/w pictures of your baby's movement even in dark. 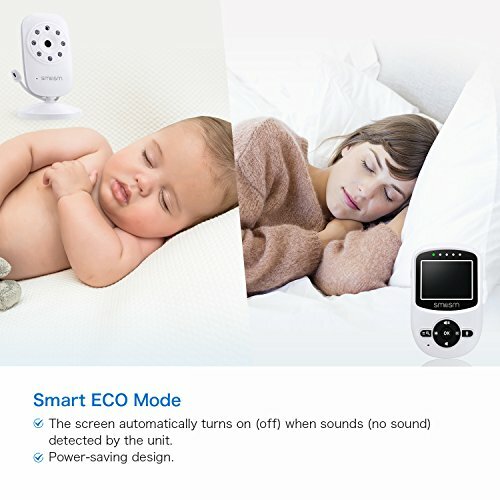 ✿ECO MODE & TEMPERATURE MONITORING✿ This sound-activated baby monitor will turn on/off the screen automatically when sound/no sound is detected by the unit. The temperature sensor helps you observe the room temperature all day long without worries. 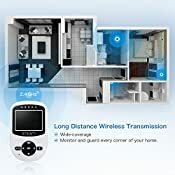 ✿LONG RANGE TRANSMISSION & 2.4"COLOR LCD DISPLAY ✿The baby monitor covers a wide range of transmission that allows you to keep an eye on your loved one. The high definition display presents the live performance of your baby. 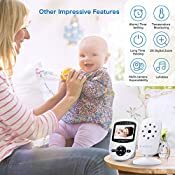 ✿OTHER IMPRESSIVE FEATURES✿Tabletop or wall mounting; Portable size is convenient to carry; Manual rotation video baby camera; This baby monitor can be paired with up to 4 cameras in different rooms.